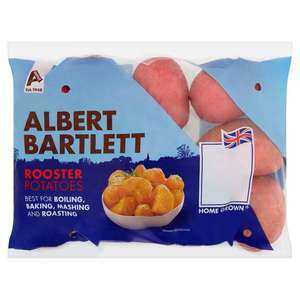 Anybody know why Tesco hasn't stocked these for about 6months, and all of a sudden are stocking them again. I boil till they are like boiled potatoes, none of this par boil stuff. cook with half a slab of brittania dripping.. boiling hot from oven without fail every time. Put the mashed potato (from boiling remains) also in the roaster too one end.. goes like fish and chips bits.. lovely! Remember to baste two or three times. Unavailable where I live for Tesco delivery..
Morrisons sells in store though. Something I actually don't mind paying full price on. Anybody know why Tesco hasn't stocked these for about 6months, and all of …Anybody know why Tesco hasn't stocked these for about 6months, and all of a sudden are stocking them again. I know I can't find them in Tesco either! Those jerks.